It’s not exactly soup weather in Austin yet. The temperature is still annoyingly hovering in the high 80s, and the stack of (super cute) sweaters I bought a few weeks ago sits on my shelf, mocking me and the life choices that brought me to the land of perpetual flip flops and the (questionable) glory of swimming holes. But that doesn’t mean that I can’t eat soup. With this soup, cauliflower proves once again that it is the ultimate magical vegetable. This puréed soup is creamy, smooth, and fluffy — like pillows and happy clouds and Smudge. It’s great topped with herbs (dried or fresh chives, Penzeys Fox Point Seasoning, freshly chopped parsley), spices (cinnamon and nutmeg, Ras el Hanout, Penzeys Tsardust Memories), or luscious fat (a little melted ghee or extra-virgin olive oil, finely chopped nuts or pine nuts). Slurp! 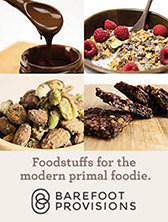 This recipe appears in my cookbook Well Fed 2: More Paleo Recipes For People Who Love To Eat. Wash and core the cauliflower, then coarsely chop. Set aside. Heat a large, deep pot over medium-high heat, then add the coconut oil. When the oil is melted, add onions, carrots, and garlic. Stir with a wooden spoon and cook until they’re soft and golden, about 5 minutes. Add the chopped cauliflower and cook until beginning to brown, about 5 minutes. Add the broth and water, then bring to a boil. Reduce heat to simmer and cook, covered, until the vegetables are very tender, about 45 minutes. Working in batches, carefully transfer the cauliflower and some of the broth to a blender or food processor. Cover the top with a dish towel to protect yourself from splatters, and purée the cauliflower until smooth, adding more broth as necessary. Pour the purée back into the soup pot, then add the salt, pepper, and coconut milk. Stir to combine and cook over medium until heated through. Serve immediately with garnishes, or store covered in the refrigerator. To reheat, warm the soup gently over medium-low heat until bubbly. Yay! This is going in my AIP-okay recipe pile come January. Thank you! Is this Whole30 compliant? It looks like it, and looks delicious, so I hope it is! It’s definitely Whole 30 compliant! Mel is doing the Whole 30 right now and all of those ingredients are allowed on the Whole 30. LMoll, almost all of my recipes are Whole30 compliant, and when they’re not, I clearly explain in the recipe that they’re “treats” or offer ingredient substitutions to make them Whole30 complian. these days i’m less interested in if something is “whole30 compliant” and more interested in the macronutrients. 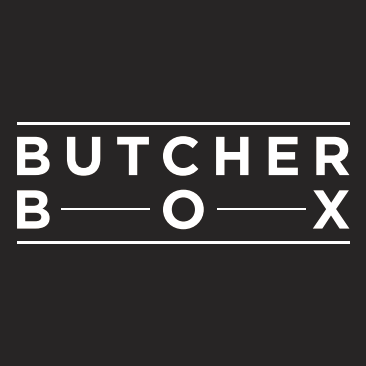 any thoughts about publishing that kind of info with your recipes? I don’t put my recipes through nutrition calculators because even though I track macronutrients, I don’t do it for individual recipes. This is almost ALL vegetables, so I figure a cup of soup is roughly equivalent to a cup of cauliflower. There’s 1/2 cup of coconut milk, so if you divided the soup into, say, 6 servings, that would be 1/6 of a 1/2 cup of coconut milk, which is pretty minimal fat… roughly 4 grams of fat. Anyway. That’s the scoop on this soup, but no, I won’t be included nutrition info with recipes. too much info to post. I like how you keep it short and sweet. This recipe looks bomb! Any chance you would post your new and improved “Bean & Bacon” soup recipe? That’s my all-time FAVORITE Campbell’s soup!! I’d love to have a Paleo version! Okay I totally made something just like this on accident a few months ago. Divine. Perfect! No dairy and it looks so wonderfully creamy and delicious. Will definitely try this! How do I avoid the sweet taste that I get whenever I use it? Is it a cooking method thing? Cooked too long? Not long enough? I’ve used frozen florets and fresh cauliflower – same result. I really want to love all things cauliflower, especially the basics like smashed cauliflower, cauli-rice and now this lovely soup, but the sweetness just doesn’t set right with me. You might try sticking to recipes that use “darker” spices with some heat, like chili powder, for example. Roasting and caramelizing the cauliflower — like this recipe and my cocoa-toasted cauliflower in Well Fed — actually heighten the sweetness, so less cooking might work better for you. Thanks for the recipe! I now know what I am making with the head of cauliflower in the fridge. I recently got your new book and I have to say great recipes, great photo’s and great layout. I’ve really enjoyed reading it and making mayo, chocolate chili, creamy cucumber salad and more. I look forward to your next book! Perfect timing!! The cold and rain continues here in the SF Bay Area and this soup looks warm and comforting as well as easy. Another Well Fed winner. YAY! I can’t wait to make this. Thanks, nice lady! Thank you for this delicious recipe! I just whipped it up while prepping my food for the week. I had a bunch of broccoli stems so I threw them in for some extra veggie goodness and it is delicious 🙂 Your cookbook is becoming my paleo bff! Yay! I’ve got cauliflower in the fridge I need to use!! In the interest of giving back, I actually made butternut squash soup today! I used chicken broth, the squash and a little coconut milk. I added about a tablespoon of sunbutter and seasoned with curry powder. It really turned out nice. It’s cool and wet here, so this will be the next soup I make! Looks lovely though as we are vegetarian will be using veg stock.. Will let you know.. Snow on the ground here in NE Scotland too..
3. I always eat dinner for breakfast so this is right up my alley! Ran across this luscious little number this morning. I was already planning on making Diane Sanfilippo’s Quick & Easy Salmon Cakes for brunch. What an amazing pairing! Topped the soup with Penzey’s Tsar Dust, red hawaiian sea salt and fresh parsley. I swear my hubby and I were making little piggy noises while we were eating! I can’t wait to eat it with Tsardust Memories on top! YUM! Love this! I don’t usually like creamed soups, but this one was delicious…and I couldn’t stop eating it! Thank you :). This is a delightful soup! Just made a big batch to help get me through Hurricane Sandy… Sure beats spagettios! This recipe is fantastic!! When I made the soup I decided I wanted it to have a little bit of heat on it, since the flavors are very warm. It was great with a heaping teaspoon of red pepper flakes. I also add a bay leaf to the vegetable mix when it was simmering to give it more depth of flavor. It makes such a great base to add anything to it. I’ve added sausage & herbs, chicken & avocado… the possibilities are endless. Love all those mods. Right on! I just made this and I’m obsessed already. Cream of Cauliflower soup from a restaurant near my house was my favorite growing up, but this was much better! Hooray! That’s such an awesome compliment… glad you like it! I have another pureed soup coming next week, and I’m torn between which one is the best. Glad I get to eat both! Ever try an immersion/stick blender? I got one last Christmas and I swear it is amazing. I still have faint black bean soup specks (pre-paleo days!) on my ceiling from using a regular blender and NOT cooling the mixture before whirling it. Cuisinart’s stick is so easy to use and clean. I made this over the weekend and it was absolutely delicious! Thank you! Keep the soup recipes coming! I made this last week and really liked it. I had enough left over for two smallish bowls so I wanted to add something to make a little more substantial lunch/dinner. I added some diced ham and let me tell you, that was awesome! The sweet cauliflower with the salty ham was just perfect! This soup was delicious! I made it for company and they ate every drop. I just started the paleo diet recently and am loving it (although I’m a vegetarian, but one who eats eggs and fish)because of recipes like this one. The sunshine sauce is AMAZING, as is the “world’s best stir fry sauce.” Your Well- Fed cookbook is the only one on my kitchen counter right now; I’m having a ball trying the recipes, and haven’t found anything we haven’t loved yet. Thanks! Glad you liked the soup! Congrats on making the switch to paleo — I love when vegetarians find ways to make it work. So great to get *some* animal protein and kick the grains. YAY! Thanks for taking Well Fed into your kitchen. Glad to be there! Just made this soup today in preparation for the cold front. This soup is delicious!!!! Love your recipes. Thanks so much for posting. I just made this and as expected, it was delicious! I just made this to eat with my breakfast, and it is DELICIOUS! I was dubious as I am not always a creamed soup kinda gal, but this soup may make me a convert. YUM with Tsardust Memories! So glad you like it! I’ve never been a soup person either, but man! both this and the Silky Gingered Zucchini Soup are in my regular rotation now. Who knew eating soup for breakfast was the trick?! Oh, no! Sorry to learn you’re under the weather… glad the soup helped! Just wanted to say, this soup is just amazing. 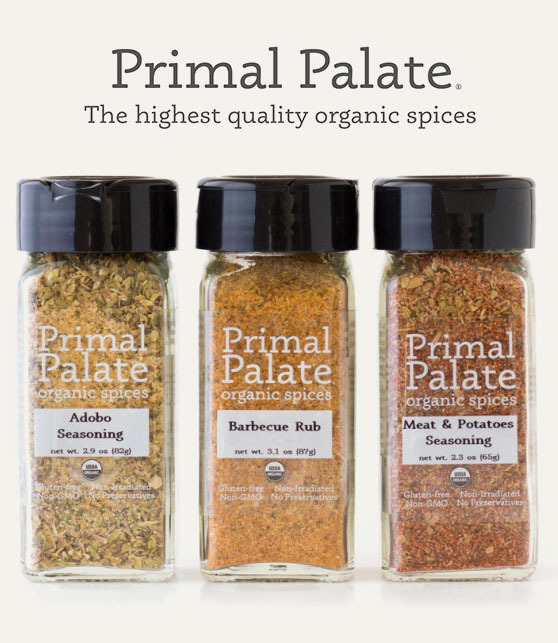 Your book has turned me onto the paleo way of living and I am truly enjoying cooking. Thank you. Hooray! Glad you like it… and even more glad that you’re enjoying cooking. YAY! Happy cooking & eating to you. I made the zucchini soup and loved it! Do I have to use canned coconut milk? Would the kind in the carton work ok? You should always only use the canned coconut milk — the kind in the carton often includes sweeteners and other weirdo ingredients. For canned, the only added ingredient should be guar gum, and sometimes you can find it without, and that’s even better. Enjoy! Yes, this should freeze just fine. Enjoy! This was seriously easy and delicious and will be great for breakfast! Thank you so much for tinkering with and perfecting all of your recipes before posting them. It’s great being able to go to your site and know that whatever recipe you post will be a winner – exactly as is. I am loving all the soups lately. I’m glad you liked it — and thank you for the thoughtful compliment! I HATE when I try a recipe and it doesn’t work, so I’m a stickler for testing at least a few times before I share. Yes THANK YOU for posting the chicken broth note. I now have a gravy idea for later and will at least not wonder forever if I could just be using my larger supply of chicken broth for this soup. Will definitely use beef broth when I want this as a soup! Love the addition of turmeric — it’s got so many benefits. Glad it made you feel cozy! I have a batch in my fridge and ate it with fresh grated nutmeg — so yum. Just found out I have to do the AIP for Hashi’s. So thankful for your tracking your progress and what you had to eat at meals. I just made a big batch of this soup and am putting some in the freezer to pull out for ease this week. Thanks for the great recipes! This soup tastes so creamy and yummy. I ended up forgetting to put the coconut milk in it, but it still tastes wonderful. Good luck with the AIP! I think the trick is to really get creative with the flavorings you CAN use: ginger, turmeric, cinnamon, and all the herbs and garlic. I’m glad you like this soup! It’s cozy, right?! I was wondering if you use the coconut milk in the cans or the half gallon size that is in the cooler for your recipes? I always use canned coconut milk. The kind that comes in the carton can contain added junk and sugar. When choosing your canned brand, if you can find it without guar gum, that’s awesome, but if not, no biggie. The only ingredients you want, however, are coconut milk and guar gum. Totally enjoyed your interview on balanced bites! A lot of good things shared. I am in recovery from chronic fatigue syndrome. It has totally made my life crazy. For the last three years I’ve been living with whoever will take me in, But somehow still manage to eat good food. The last place I lived had the Cuisinart stick blender. I agree! It totally rocks! It might be my favorite kitchen tool also. I made this soup today with the crummy stick blender that someone gave me. It still turned out fab! The family I live with want the recipe. I also like what you shared about switching up flavor profiles, and also what you shared about looking great but still being unhealthy. Thank you for listening to the podcast and for stopping by to let me know you liked it. That’s very thoughtful of you! Hope you’re Chronic Fatigue is feeling better. Sending all good wishes. Can’t wait to try some more recipes!! I had about 3/4 of a head of cauliflower in the fridge but I really wanted to try this soup today because it’s a cold and rainy day and I’m getting a head cold. I also had an avocado that was to the point of needing to be used RIGHT NOW, so I tossed it in the Nutribullet with the cauliflower so that I’d have enough purée to put back in the stock. I garnished with nutmeg, bacon pieces and pecan pieces. That sounds luscious! I hope it helps you feel better! I’m on day 4 of my first whole30, and I think this soup is going to be my lifesaver!! It is absolutely delicious! Loving your blog!! thanks for all the great info! I made this soup for lunch today. I added some curry powder and chili powder because it was just a little bland for me and it turned out amazing! So amazing that I gave my nine month old some bites (because he always wants whatever I am eating of course) and he loved it. This soup will definitely be going into rotation at my house… even after I’m finished with my whole 30! The texture of this soup is so smooth and satisfying. Thank you for the great recipe! 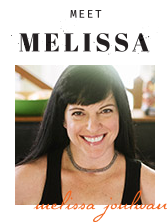 I have both of your books on my Kindle Fire and I have loved each of your recipes I’ve tried so far. I’m glad you like the Kindle versions — thanks for buying them! And I’m doubly glad you like this recipe. YAY! 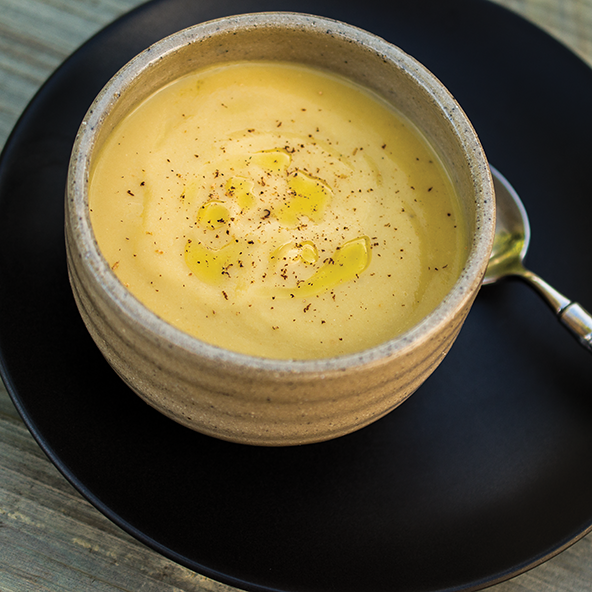 Tried this soup and the cumin-roasted carrots today–both were delicious! Thank you so much for posting! Thanks for letting me know you like them. Happy cooking! I love this recipe! I started my Whole30 a week ago and am loving using the four week plan on your site. I think it will be easy to keep doing cook ups and paleo friendly meals after the Whole30 is done. Thanks! Your website is a lifesaver. I am starting the Whole 30 this Monday. I started it 1/2 way last week by doing research and trying your methods to accommodate them to my schedule. The hot plates have been a lifesaver, as have the sauces. I also made myself a Thai sauce to drizzle over any hotplate, making an instant Thai treat! All the best! Best wishes for an awesome Whole30! So smart to do a test run! Have fun in the kitchen, and let me know how your month goes! This is simmering now (I’m tempted to put it in the instapot because I’m hungry!) and tomorrow I’m making your carnitas and testing out some of your new meatball recipes! 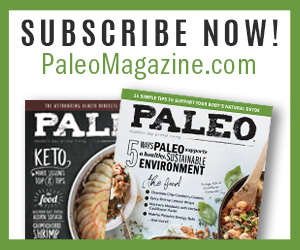 You make paleo so easy for us! Oh… fun! 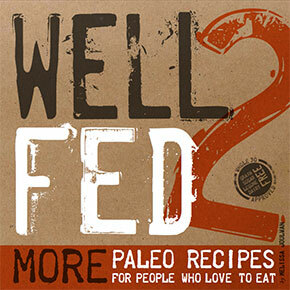 Hope you like the new recipes in Well Fed 2! The meatballs are some of my favorites… enjoy! My husband and I started Whole 30, 44 days ago…With the help of your recipes, we’re still going strong. (I must say, before this I was a sugar-holic…and still can’t believe I could follow this idea )But, after feeling so great, we didn’t want to quit. We’re making this great tasting soup tonight, our 2nd time… Thanks for all your efforts!! Just got your “WF2”,book as a gift for my hubby!! We are loving your recipes!! Right on! Congratulations on 44 days of awesome! It must feel so good to be free of the sugar. YAY you! I’m really glad my recipes have helped you out! Thank you for buying Well Fed 2! Best wishes for all good things to you! This was delicious. I used an immersion blender to puree the vegetables – too lazy to haul out the food processor and then clean all the bits. Next time I might just add the whole can of coconut milk and reduce the water. Yummy – and perfect soup for the snow storm sitting on top of VT right now. Thanks for this recipe Mel! I was getting sooooo tired of eggs in the morning, so this soup is a wonderful addition to my breakfast rotation. I am having it RIGHT now with a sausage patty. So. Good. And so great that its Whole30 compliant! Thanks! YAY to soup for breakfast! Made a double batch of this tonight for my family (dinner tonight and lunches tomorrow). Also put a pork roast in the crock pot all day and then shredded it and put it in the middle of each bowl of soup…..Delicious! My husband and three kids (14, 12, & 4) loved it. I tweaked the recipe a little, added the entire can of coconut milk (since I doubled the recipe) and used less salt and pepper then the recipe called for, like I said, it was great. I look forward to making your sweet potato soup in a few days. Thank you for the recipe. I just made this from Well Fed 2 and topped it with the olive oil and nutmeg, but added browned pork sausage. YUM! Tried this because I need something faster for breakfast, and liked that suggestion. But we sampled tonight and love it. This soup made me think of a wonderful recipe I have for cream of parsnip soup, which I would love to make W30 compliant. My big hiccup is that it calls for a large boiling potato–I assume for thickening or just making it nice and smooth.. Can you suggest a substitute? There is nothing else that needs to be changed. Well, except the cream; but coconut milk will fix that. If it’s a blender soup, you could probably skip the potato and just reduce the amount of liquid a little. You can use the proportions of the cauli soup as a guide — or email me the recipe, and I’ll figure it out for you. What about just adding in some cauliflower?? I’m eating it with a little Penzeys Maharajah Curry stirred in…. SWOONING!!! I made the soup and it was great. Added diced chicken and almonds for a complete meal. Can you tell me how long it is safe to eat after making it? It has been in the fridge for 5 days. Thanks. Day 17 of Whole30! Happy Whole30-ing! If you’ve had it in the fridge for 5 days, you probably should finish eating it today. In the future, you could put half a batch in the freezer if you have trouble eating a whole bunch within 4-5 days. Enjoy! Just found your blog…love love the recipes. Made this last night and added just a bit of mild curry, it was awesome! Great site, thanks. Had a ton of cauli leftover from Thanksgiving, so I whipped this up yesterday…amazeballs. It’s 80 degrees here in Florida and I just hoovered another bowl. Thanks! Love your site and your recipes! This is my first time making this recipe so just wanted to clarify. In the recipe it says to puree the cauliflower, do I puree the carrots and other vegetables as well? Yes, puree the whole shebang. Hope you like it! I can’t wait to make this! Any reason not to use an immersion blender, and is there such a thing as compliant beef broth bought at a store? I always use my immersion blender; go for it! I haven’t found a Whole30 compliant broth, but if I run out of bone broth, I buy Pacific Organic because the ingredients aren’t too bad. I found one at Kroger, brand name is Imagine, and Whole Foods makes one under their own label, 365. Loved this recipe- swapped in broccoli and chx broth. DELISH!! Thanks! Just made this and ate two bowls and it’s hours until dinner. Delicious stuff and gave me something to make with the bone broth I had. I made this recipe for dinner the other night, and it was scrumptious! It was my first foray into actually cooking a vegetable-based Paleo dish, rather than just eating raw veggies. This soup was so deliciously creamy and filling. My husband, who is very picky about soups, absolutely loved it! Honestly, I don’t know why I waited so long. I make a puréed soup every week and mayo every week — the stick blender has been such a workhorse. Love, love, love. I’m not a huge cauliflower fan after too much “mashed” cauliflower in the early days of my paleo life and so totally ignored this recipe. Wish I hadn’t. Delish! I’ve never been a huge fan of soup, but this recipe intrigued me since I love cauliflower. This is seriously the best soup I’ve ever had! I just finished off the last of my batch for lunch. It’s great just as it is, or with a little ghee on top, or topped with crumbled bacon. Delish! Also, I just recently discovered your site and all of your wonderful recipes. I have now made several of them. Thank you for all you do! You really have made my meals so much easier and more enjoyable! I’m so glad you found me — and very happy you gave this soup a shot. I agree: it’s really fun to put different stuff on top. This soup was amazing! I didn’t think I would ever say that about anything with cauliflower as the main ingredient- it was always “ok” at best…. But I followed your recipe exactly and was pleasantly surprised by the results! 🙂 even my husband that doesn’t like cauliflower had it for breakfast and dinner today! Lol. I start my whole30 on the 15th and this will def be on the menu! Looking forward to trying your other recipes too! I’m so glad you liked it! Soup for breakfast is the best! Hope your Whole30 is awesome. Have a great month! I really want to make this–it looks delicious! But I’m trying to do the Whole 30 plan and all the beef stocks seem to contain small amounts of sugar or soy and some even say they contain wheat. What type of beef broth do you use? When I’m doing the Whole30, I usually end up making my own broth because I haven’t found a commercial brand yet that doesn’t include some sugars. Pacific Organic is really good and pretty clean, but it does include some sugar, I believe. Whole Foods sells their own broth (the 365 brand) and it is sugar free. I recently found another sugar free Whole 30 approved broth at Kroger- the brand is Imagine. Never mind…. I just realized that the caramel color found in both of these is actually a form of sugar. ? Just made the soup today! It is so good. Quick question though, is coconut milk alittle “curdy” ? When I put the milk in, small curds of milk are now in my soup. Sometimes the coconut milk has solids in it because the water separates from the coconut meat/fat. It *should* melt when you put it in hot soup. If not, the coconut milk might be “off.” There should be no solids once the coconut milk gets hot. Added bacon and a little red pepper. Pow! I have made at least 3 of your recipes and all have been great. We recently made the chocolate chili and it was awesome. I was really looking forward to this soup and it was a disappointment. I had to really spice it up after it was ready, added freshly grated nutmeg, quite a bit more salt, some smoked paprika and more pepper. it wasn’t terrible, but at best just OK. We ate some sausage along with it and found adding it to the soup add a bit more flavor. I may try again adding some apple or something, but as it is written, I would not make again. Congratulations on Whole30-ing! I’m glad this soup was a winner for you! Thanks for letting me know — that’s super awesome of you! Can you substitute frozen in place of fresh cauliflower? By the way, I love every single recipe I’ve made from your Well Fed Book’s. You can! You’ll probably want to use two bags of frozen. I was wondering if I could use olive oil instead of coconut oil? I’m still having trouble believing that coconut oil and ghee is healthy for you. In any recipe, all fats can be substituted 1:1, so you can use whatever form of fat or oil you like. Enjoy! Delicious and filling! I made a batch two days ago, and it was gobbled up so fast that I made another bigger pot today. I noticed that it took longer than 5 minutes to brown all the cauliflower, but everything else went as stated. I like the idea of having it for breakfast or having a small bowl with dinner. Is there no end to the wonders of cauliflower?! Thank you for the great recipe. Will this still be ok if I use water instead of broth? I’ve looked everywhere for compliant broth and had no luck. I was hoping to make this without having to buy broth, but I understand it might not be as flavourful. Update–I went ahead and did it. It’s ok–obviously, it’s less flavourful because I didn’t add broth, but it’s not terrible. I accidentally added a whole can of coconut milk (it had separated and plopped all out). I personally thought (because of no broth) more salt was needed. I experimented with adding some cayenne pepper to just one bowl, and that was good too. I don’t have any nutmeg, but I agree that it would be perfect with this soup! This the first recipe that I have tried of yours and it was so delicious that I just had to come leave a comment. My daughter who is not a fan of soup is on her second bowl! I’ll be making a double batch next time. Thank you! I love this story! Thanks for letting me know it was a hit… glad you all liked it. Congratulations on Whole30-ing! I hope you’re feeling awesome physically and mentally. YAY for you! I absolutely love this soup. However I just bought an Instant Pot (pressure cooker) and I am a total newbie. I really want to make this soup in the IP but I don’t know how to adjust. I’m excited your carnitas recipe had the IP modifications since I make that constantly but can anyone help me with this recipe? Melissa? I looked through comments and don’t think that it’s been answered. Thanks! Thank you! That’s funny because that is the recipe I found and adapted for your recipe. 🙂 It worked great! I, however, was slightly nervous that I would blow up my house with my tweaking. Just finished leftovers for breakfast. Thanks again for the response. I can’t wait to try your carnitas in the IP. Another winner!! Oh my! and YES to this recipe. I’m definitely adding this soup to my favorites. I suspect that I may end up adding all of them. But this is certainly easy, delicious, and lunch friendly for work. And it’ll definitely become a breakfast favorite and the silky gingered zucchini a late night favorite. A head of cauliflower is about 4 cups of florets, so 3-4 cups should work! Enjoy! I still love this recipe, especially to get my veggies in during breakfast. It’s so nice to have a warm cup of soup on a cold NY morning! I am now making this in my Instant Pot and blending with my immersion blender right in the pot! It’s such a good shortcut. And I forgot to say….Happy New Year!! Loved this. I added marjoram and red pepper to give it a little heat. So good. Is this soup freezer friendly? I just made a batch and is delicious! I’d like to freeze small portions for quick lunches throughout the week. Yes, you can freeze it. When it defrosts, if it’s a little watery, just blitz it with the stick blender again, and it should get smooth and creamy. I’m trying to make the switch back to Paleo, with the added bonus of cooking for a dubious toddler and husband too. We all loved this, and my picky toddler, who usually turns her nose up at vegetables, scarfed this down! I didn’t bother with the puree since the pieces are easier for her to grab. 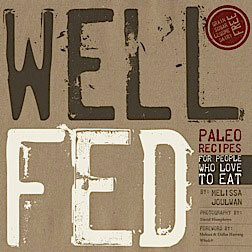 I made this recipe from your WellFed2 cookbook and it was fabulous! I used Veg Broth as I’m prescetarian and it was absolutely delicious. I ate 3 helpings at once – so good! my go to recipe! 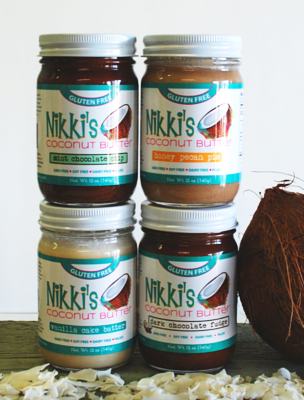 Quick question – my friend can’t have Coconut – could she substitute cream for the coconut milk as she eats dairy? Yes, if your friend can tolerate dairy, cream or yogurt are both good options. It’s also pretty tasty without, too, but the extra creaminess is nice. Can’t wait to try this! One question – and I may have missed if it was already asked – has anyone tried chicken broth instead of beef? Wondering if it will significantly change the flavor profile? Love your cookbooks, love your blog! And I love your posts about Prague – will be traveling there with my daughter for a school trip in the spring and so we are enjoying hearing about life there!